Florestan has been wrongly imprisoned by Don Pizarro for attempting to disclose certain crimes. With the intention of gaining Florestan’s freedom, his wife, Leonore, disguised as a man (Fidelio), has found employment as an assistant to the soft-hearted prison warder, Rocco. Marzelline, Rocco’s daughter, falls in love with Fidelio and wants to marry ‘him’ in preference to the undemonstrative Jaquino (another assistant warder). On discovering that a government minister will visit the prison, Pizarro orders Rocco to kill Florestan but he refuses. 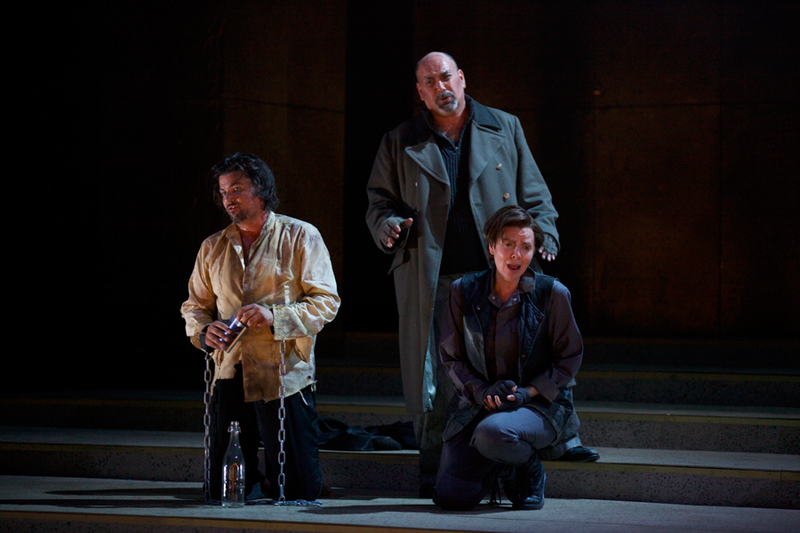 With the tyrant Pizarro out of the way, Fidelio persuades Rocco to allow the prisoners out of their cells to enjoy some rare sunlight; she hopes that her husband will be amongst them. He is not. Pizarro returns unexpectedly and angrily orders Rocco to dig Florestan’s grave. Fidelio joins Rocco in the cell where Florestan is being kept in solitary confinement. She is able to give her husband bread and water – but in his delirium, he doesn’t recognise her. She manages to hide in the cell so that when Pizarro arrives to kill his adversary, Fidelio comes between them, drawing a gun. At that moment, the arrival of the government minister is announced, Pizarro is arrested, and the prisoners are released to be returned to their families. 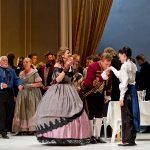 Rocco explains what Fidelio/Leonore has risked to rescue her husband, and there is general rejoicing at her heroism. The minimalist set – dark stone columns set in perspective and white blocks-worked well, and there was some highly effective lighting. Notwithstanding such caveats about both work and production, Fidelio remains a powerful cumulative experience in any half-decent performance, and musically this was much more than that. Lee Bisset was a convincing Leonore, full-bodied and redblooded in voice and character. The American bass Gary Jankowski’s Rocco was a complete success, conveying the simple humanity of the man with beautifully warm, rounded tonal quality, while Mark S. Doss’s powerful Pizarro suffered only from his being directed to emulate a pantomime villain, his success at which was rewarded at the curtain calls with boos..! The generally accomplished playing of the Dorset Opera Festival Orchestra often attained an exciting frisson. In sum, this was a flawed performance of a flawed opera. It was nevertheless one that did great credit to the company. 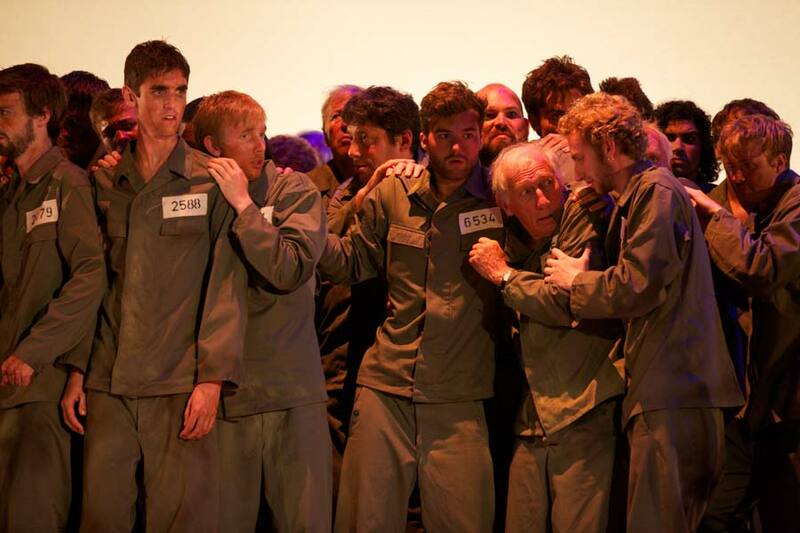 Steve Howell’s design is verging on apocalyptic… his design and Laurence Dale’s commanding direction transform the prison into a concentration camp, Pizarro’s henchmen into SS officers. 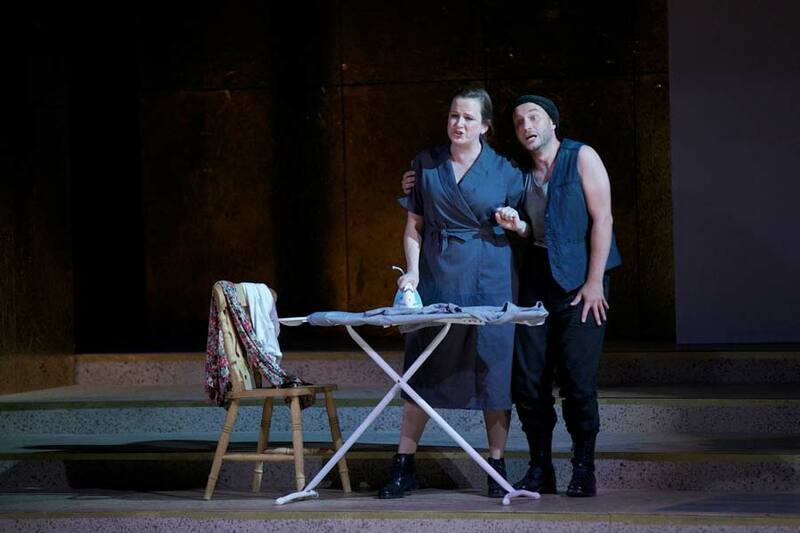 In this modernised adaption, Fidelio gains a new relevance and is fast-forwarded out of the 18th century. The orchestra is expertly marshalled by conductor Phillip Thomas who handles his baton like a wand, shooting it suddenly and un-expectantly forward at his musicians. Obligingly they spark into life delivering one explosive piece of music after another which has the audience whooping and cheering more than once. The principal parts are all strong – with comic performances shining in the green and naïve Marzelline (Johane Ansell) and angsty Jaquino (Tyler Clarke) who growls his way through the performance like a threatened Jack Russell terrier with permanently raised hackles. Gary Jankowski’s Rocco is a commanding presence whose reverberating bass envelops the auditorium, whilst Lee Bisset’s double role of Fidelio and Leonore is convincing and cleverly executed. Once again however, it is the sheer power of Mark S Doss as Don Pizarro who triumphs, just as he did as Amonasro in Aida. Sweeping about the stage, he effortlessly commands the ensemble casts of prisoners and henchmen before blasting us once again with the grandeur of his vocal skill. Doss has been a driving force behind both Aïda and Fidelio and the decision to cast him in integral roles in both productions has stoked the fires of the Festival’s already stellar reputation. 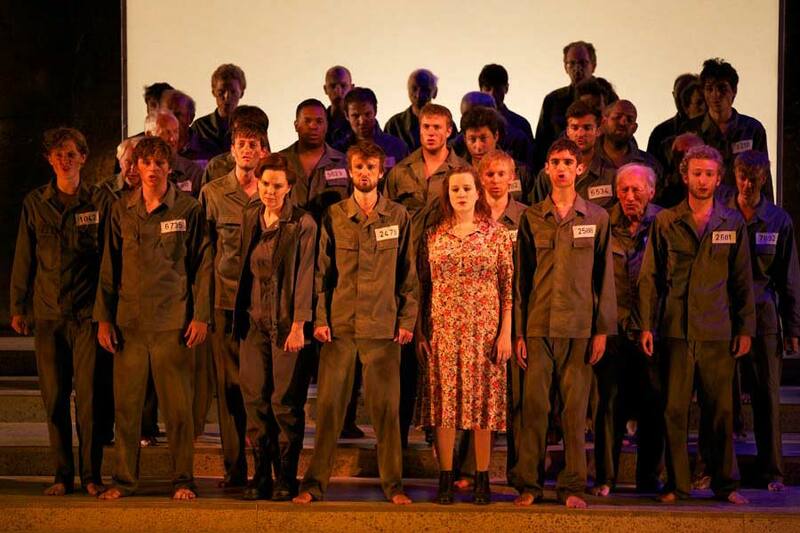 Director Laurence Dale, and his designer Steve Howell and costume designer Gabriella Ingram placed the Dorset Opera production of Fidelio in a setting that evokes Orwell’s 1984. …the governor (the charismatic Mark S Doss) exuding brutal power in black leather. …Rocco (a humane and even humorous performance by Gary Jankowski). Lee Bissett brought searing passion to Beethoven’s beautiful music, giving a convincing performance both as Fidelio, the sensitive and kindly prison guard and as Leonore, the courageous wife. There was great work from the chorus, directed by Nicolas Mansfield, and the orchestra, conducted by Phillip Thomas thoroughly deserved the loud applause for its playing. Excellent lighting, by Charlie Morgan Jones, created an intense and claustrophobic atmosphere. 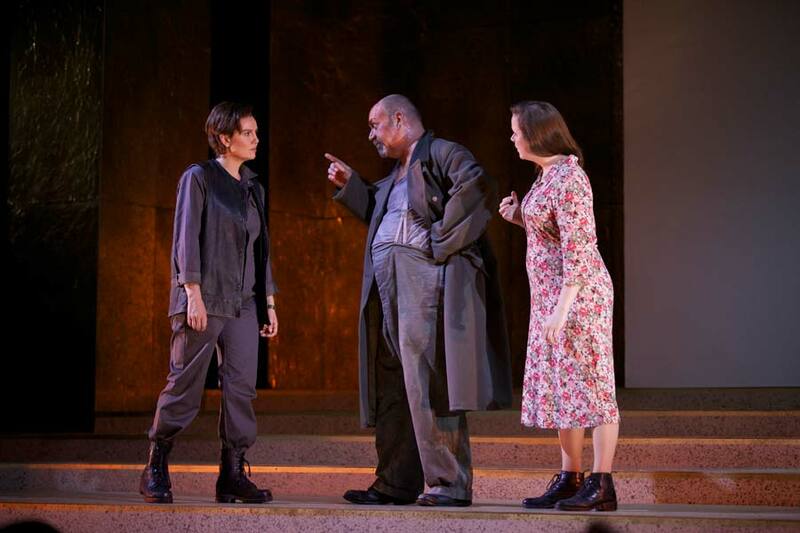 Fidelio may not be an easy opera…but the audience packed into a steaming hot Coade Theatre responded to this excellent production with enthusiasm and cheers. 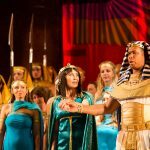 It is another triumph for Dorset Opera Festival, in its 40th anniversary year.